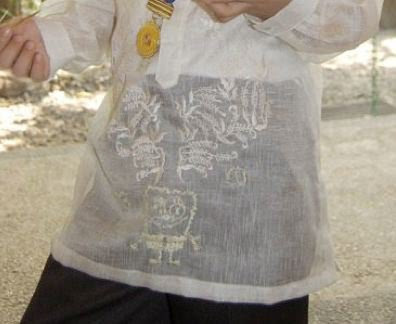 Remember how I got completely obsessed with this barong tagalog with the cute Spongebob design for Kenji's Graduation Day? The one with the irreverence that simply spoke to me? Well, since I'm a complete cheapskate and because I plead personal creativity, I decided to do it myself --as if I haven't learned from my last disaster that was my DIY Kenji's birthday cupcakes. I went through bouts of grief and sleeplessness soon after that. I researched on barong tagalog fabrics and on the proper ink or paint that would adhere to it. It was tough since none of the pro barong handpainters would spill their secrets online. I was considering iron-on prints, acrylic paint, fabric paint, stick-on tattoos, even Pentel markers. 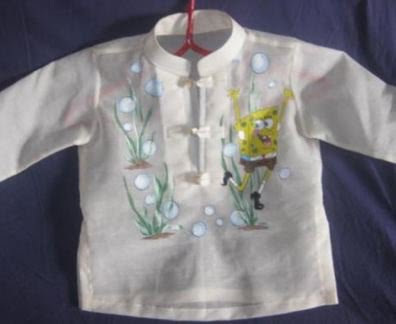 Come D-Day, Jing came home with an embroidered barong tagalog that freaked me out, to say the least. I said we needed a the plainest barong tagalog! When you're doing art, you don't use a used canvas! Jing, forever patient with my stubborness, told me that there was no such thing as a plain, empty barong. And that I can still add Spongebob to the design. And I did! With frakken' embrodery! Embroidery was on the canvas already. Adding a different medium will just cheapen the look. But really, the last time I embroidered was in 6th grade Home Ec --so it's a dream that I actually managed to pull this off. 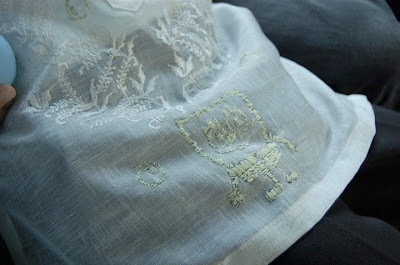 After 5 hours of sewing, fouling up, and resewing (and not sleeping a wink), the result was a classier version of the online Spongebarong I have been excessively preoccupied with the past few days. People ate it up! 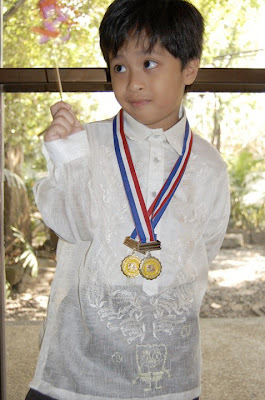 Even the prudes at school thought Kenji's barong tagalog was unique and clever. And I beamed like a beacon. Personally, I think it rocked. Rocked even better than the inspiration, I might add. And for only P200. Job well done and sleep well deserved. God, my obsession for the inane is insane!